Please plan to attend the REMC Community Day on Friday, October 13 from 10 a.m. to 2 p.m. The REMC is located at 3400 S. State Road 3 New Castle. Free food, entertainment and also learn about the County’s comprehensive plan. Sit in one of two (or both) 10-minute presentations that describe the year-long planning process. A sign with the presentation times will be posted outside of the conference room on the day of the event. 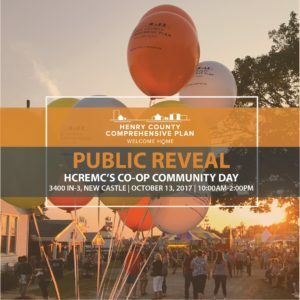 The presentation times will also be available on the project website: henrycountycompplan.com a few days prior to the event. Visit a number of interactive exhibits that were used at the public open houses, and read some of the earlier comments that helped to determine many of the recommendations that are in the proposed plan. Review a hard copy of the draft plan. Ask questions or offer your thoughts and suggestions about the process, the recommendations, or both. Representatives from American Structurepoint, the firm hired to facilitate the planning process and develop the draft document, will be on-site for the duration of the community day event.